Minecraft is the winner of a new arts award for computer games. The prize was announced at the finale of the GameCity videogame culture festival in Nottingham. The title is the work of an independent Swedish company, Mojang. Players have to build objects out of blocks in an open environment. The game was selected over other releases including Valve's Portal 2, Southend Interactive's Ilomilo and Game Freak's Pokemon Black. 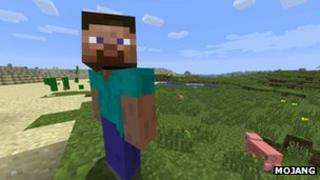 "It's a great honour to be compared to those games," said Markus Persson, Mojang's founder. "Winning this award helps us to try to make Minecraft the best game it can be." Nearly four million people have already bought the title online, despite the fact it is still in beta. It is scheduled for a formal release next month. "It just wasn't like anything else... it felt like it had an expanding life of its own. It had an organic nature," one of the judges, Ed Hall, told the BBC. I think that technology is a real red herring.... Otherwise we wouldn't cry at Bambi. It's not about photorealism. "It's simplistic and addictive, and there's an element of beauty in what you are doing." GameCity's director, Iain Simons, said he was "delighted" by the choice. His festival is now in its sixth year. Over that time he says he has seen a rise in the average age of gamers, and more women attracted to the activity. "There is a much broader constituency of people playing games," he said. "They have become more normalised, they have been more culturally confident and this prize, and the festival, is very much about exploring that confidence." Part of the phenomenon is linked to the rise of smartphones. Today's handsets helped popularise the kind of sophisticated games that used to be restricted to dedicated mobile games machines, and larger home consoles. Advances in computer processors and graphics chips undoubtedly offer developers a bigger palette to choose from. However, Mr Simon does not think the developments make any difference to the designers' status as artists. "I think that technology is a real red herring. What technology is driving forward is the ability for games to look more real. To look like what a triple-A blockbuster would look like," he said. "I don't think that is in itself something that makes them art. Otherwise we wouldn't cry at Bambi. It's not about photorealism." The contest's judges appear to agree, admitting they picked the most basic looking title on offer. The diverse 13-person jury included Dr Who actress Frances Barber, Labour MP Tom Watson and the artistic director of London's Southbank centre, Jude Kelly. Not everyone was convinced of Minecraft's merits at first. The composer, Nitin Sawhney, who was also on the panel, was critical of its soundtrack. But ultimately neither the look of the game nor its music proved fatal to its chances. "[We asked] was there one that we felt was head and shoulder above the rest? Was there merit in the game enhancing life and enjoyment beyond just playing the game itself? Could it make your view of the world better?" said Mr Hall. "Could a computer game be viewed as something that wouldn't be sneered at in the future?" Minecraft does involve traditional staples of gaming, including night-roaming monsters and the chance to fight multiplayer battles online. However, it was ultimately selected on the basis of its mood and ability to encourage gamers to become creative. "It's the broadest definition of art that you can have," said Mr Hall. "But computer games are definitely artistic. There are images and storylines that engage you, ideas that confuse your mind for hours and a whole package that keeps you coming back for days."